In 2016, two sets of beautiful 19th-century dishes were donated to the MHC. 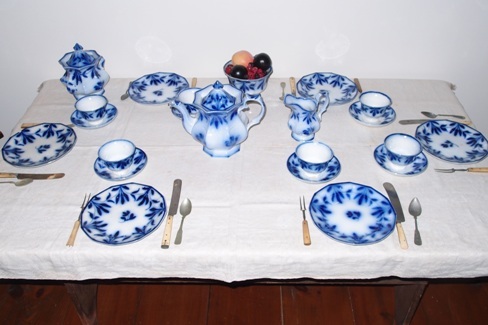 The first is a full table setting of “flow blue” dishes, circa 1870, that belonged to Susan Godshall Frederick Rosenberger (1854-1932) of Souderton, PA. She married first, in about 1873, Benjamin H. Frederick (1852-1891) of Franconia Township; then Amos Rosenberger (1852-1924). Susan was a member of the Franconia Mennonite Church and is buried there with her first husband. The dishes may have been a wedding gift at their marriage. Donated to the MHC by their great-granddaughter, Dorothy N. Benner (2016.33.1-26). Flow blue china was similar to traditional blue-and-white pottery, but the blue design on the dishes was intentionally blurred by adding a cup of lime or ammonia to the kiln during glazing. A second set of dishes are four matching plates, circa 1860, decorated with the “stick spatter” method, in which small pieces of sponge shaped into patterns are attached to the end of stick and dipped in paint for application to the plate. These plates were at one time in the collection of Earl & Ada Robacker, who wrote a book on spatterware and sponge-decorated ceramics. Gift of Hiram & Mary Jane Lederach Hershey (2016.31.17-20).